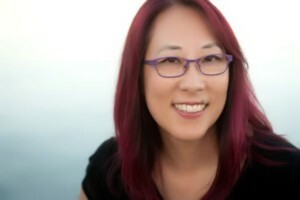 What is not to love about Debbi Michiko Florence, a writer with a bunny, two ducks and the most adorable puppy ever? (please don’t tell Winston I said that!). And to top all that off, she has a brand-new series that I am very excited about featuring Jasmine Toguchi, eight-year-old flamingo fan. 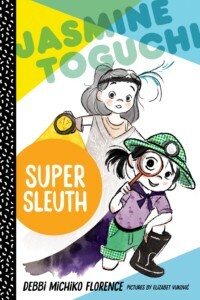 The first is Jasmine Toguchi, Mochi Queen, and the second is Jasmine Toguchi, Super Sleuth (Farrar, Straus, and Giroux). And here’s what I say: you only have to wait another week, until July 11, to get your hands on these great books. Can’t wait to share them with my grandkids! This week I am working on revisions with my editor for Jasmine Toguchi, Flamingo Keeper, book 4 of my debut chapter book series. At the same time, I’m preparing for the launch of the first two books the series – Jasmine Toguchi, Mochi Queen and Jasmine Toguchi, Super Sleuth. This has been a long journey for me. 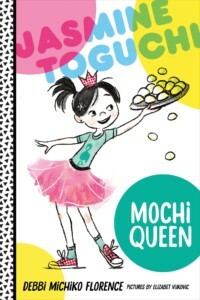 From the moment I decided to pursue a writing career to the moment I sold Jasmine Toguchi, Mochi Queen, 15 years had elapsed. It’s been a bit of a journey for Jasmine as well. It’s been seven years from idea conception to book birth! To celebrate, I thought I’d share ten things about Jasmine and me. 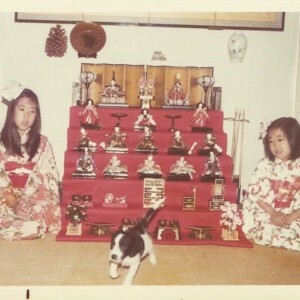 Jasmine Toguchi is a 4th generation Japanese American living with her family in Los Angeles. I am a 3rd generation Japanese American. I was born in San Francisco, and when I was 7, I moved to Los Angeles, where I grew up. Jasmine climbs her neighbor’s apricot tree to use as her special thinking spot. My next-door neighbor also let me climb her apricot tree (although I didn’t use it as a thinking spot). Jasmine’s favorite animal is the flamingo. When I was growing up, I loved all animals, but I favored dogs. 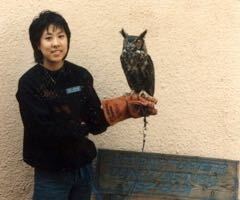 Later in college at the University of California, Davis, I worked at a raptor rehabilitation center where I helped take care of orphaned and injured raptors (birds of prey), and owls became my favorite animal. Jasmine knows a few Japanese words and phrases, but can’t speak the language. When I was her age, I was bilingual in Japanese and English. I attended Japanese School for most of my childhood into my teens, and my family spoke both languages at home. Unfortunately, as an adult, I have lost the ability to speak Japanese fluently, although I can squeak by when I’m in Japan. Jasmine is confident and spunky, speaking up and going after what she wants. She’s not afraid of the dark or of heights. I was not as confident as Jasmine when I was growing up, and I was definitely afraid of the dark and still am nervous of heights. Jasmine doesn’t like nuts in her brownies. Neither do I. And I especially detest walnuts. Jasmine’s favorite book is Charlotte’s Web by E.B. White. It was a favorite of mine as well, but the books I read over and over in the third grade were the witch books by Ruth Chew. 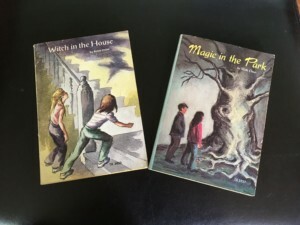 I still have my childhood copies of Witch in the House and Magic in the Park. Jasmine eats her mochi with cinnamon and sugar, exactly how my daughter, Caitlin, ate hers when she was a child. Jasmine doesn’t give up going after her dream of pounding mochi. I didn’t give up going after my dream of getting my book(s) published. You think you know a person, then you find out about walnuts. So excited for you, Debbi! LOL yeah icky walnuts! And we have a huge walnut tree in our front yard. Too bad! 😉 Thanks for being excited. Hope to see you soon!